Is This A Platform For Future Tram-Trains? Whilst I waited for my train to Grantham, I had a quick look at the Northernmost Platform at Nottingham station. Platform 1 is a through platform and it looks like there could be access from both sides in the future. The redesigned Nottingham station certainly has all sorts of possibilities for future development. This Google Map shows the layout. Platform 1 is at the top, with the East-facing bay plstform 2 clearly visible. It would appear that tram-trains could use the outer platforms and then be connected to wherever, as the station sits on a large site with space to the North and South. The section called Railway Platforms in the Wikipedia entry for Nottingham station, says this. Finally the southern side platform is numbered 7, and can accommodate a thirteen coach train. Sufficient space exists to the south of this platform to add a second platform face, effectively converting this side platform into an island platform, if traffic increases to justify it. When you compare Nottingham to other places like Birmingham, Manchester or Leeds, the city is truly lucky to have a station with so many possibilities. There also are not many places in the UK , where you could run the main tram line at right-angles over the main station. But it is a very good way of connecting the two modes of transport. 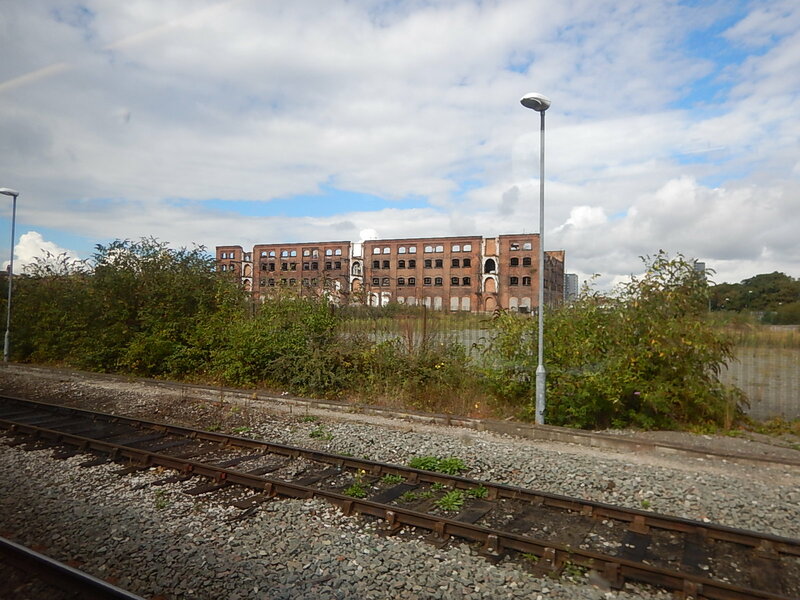 To the East of the station, there is also an enormous site with these derelict buildings. The city must have plans for these. But then Nottingham is very much saying that the City has an exciting and prosperous future. On Saturday, I went out without my real handkerchief, so just before I got my train, I popped into Boots at Liverpool Street station and bought a pack of tissues for the princely sum of forty-five pence. As I always do in Boots, I used a self-service till, but this time I used my contactless American Express card for the purchase, by just tapping it on the reader. In some ways that seemed a bit cheeky to me and it certainly raised a smile in myself. So now, my on-line American Express statement has an entry for 0.45p against Boots. It got me thinking and yesterday I was taken short in Nottingham station. 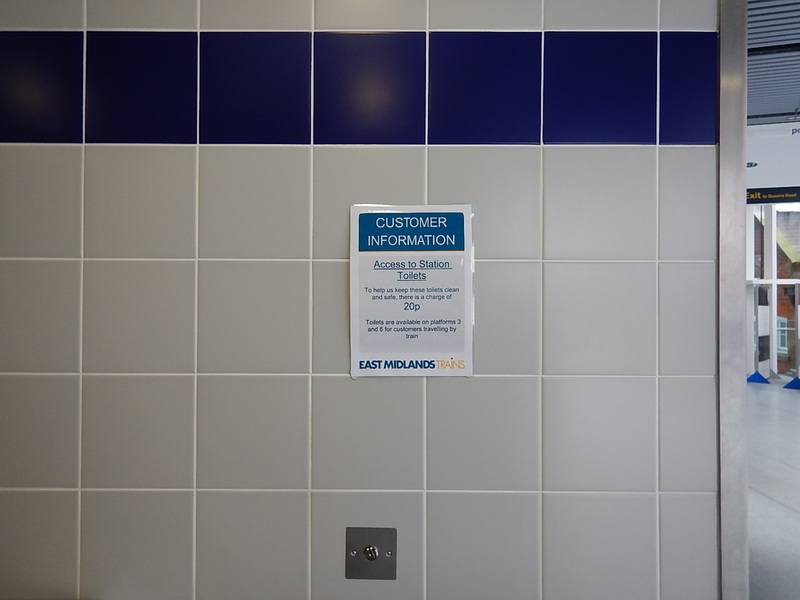 How long before public toilets like these in stations gocredit contactless? When I arrived in Nottingham, the weather was still good, despite rain being forecast, so I went for a walk right around the train station to see if there was space for the junctions to connect tram-trains coming in as trains from points East and West to access the tram line that crosses the station in a North South direction with a tram stop above the station. This Google Map shows the area, where I walked. Note that this map was created before the tram line over the station and the multi-coloured multi-story car park were built, but the old tram-stop on Station Street is clearly marked. The foot bridge over the station, which is a public footpath that also allows pedestrians to access the trains is the only bridge across the station. I started by walking East along Station Street that runs along the North side of the station, then crossed the rail lines on the road bridge before walking back to the station along Queen’s Road. After a brief pit stop in the station, I crossed South and followed the tram route intending to pick it up at the next stop to go to Toton Lane. But it was a long walk, so I crossed back North across the railway and walked back to the station along the canal, from ewhere I caught the tram South. Currently Wikipedia lists three possible tram-trains routes from Nottingham to expand the NET. Two are in the East; Gedling and Bingham and one is in the West; Ilkeston. I think there is plenty of space around the station to accommodate these routes. I suspect too, that as the routes have been discussed since the mid-2000s, any current or future development has been or is being built, so that it doesn’t compromise any possible tram-train connections. Phase 2 Of The Nottingham Express Transit seems to have opened without a hitch and from what I saw, the reactions of the passengers seemed to be very positive, as they travelled around with smiles on their faces. These were some of many comments I heard from fellow passengers. I can get to the hospital easier, by parking at the Park-and-Ride by using the tram. My grandchildren love the tram. I’ll use it instead of driving in a lot of the time. A student didn’t realise the tram went to the University until I told him and he was pleased. These comments lead me to the conclusion that I doubt, they’ll be scratching around for passengers. I do have some reservations on the system, which is otherwise well-designed. One of the many Customer Service Representatives at Nottingham station, told me that she had already been asked by a traveller from London, if contactless ticketing with a band or credit card was allowed. Hopefully, as their Mango card is a touch-in and out system, they will be able to incorporate this later. In my view contactless ticketing with a bank or credit card is something that any transport system should allow as it is so visitor-friendly. Maps at tram stops do exist, but they are only small and should be bigger, with perhaps showing walking routes to local attractions. For instance, the stop at Meadows Embankment should show visitors how to walk through the gardens and along the river to the major sports grounds. There is also a need for a display at the Nottingham station tram stop, showing departures and arrivals in the main station below. But my biggest conclusion is that now the NET is a real system, rather than a line to just the north of the city, is that it will suffer from London Overground Syndrome. The London Overground was designed and opened in 2009, with just enough three-car Class 378 trains, with platforms to fit these trains. These have now been augmented with additional trains in 2011 and progressively lengthened to five carriages, which has necessitated lengthening the platforms. NET doesn’t have the platform lengthening problem, but I do feel they will have to beg, borrow or steal some extra trams. At least the track and signalling seems to be able to cope with two different tram types, so if say more trams came from a new supplier, there would probably not be a problem. After all, Edinburgh, Sheffield and the Midland Metro are the only tram systems in the UK with one type of tram. Soon Sheffield will have two. Just before I left, I talked with one of NET’s Customer Service Representatives. Except that he was a Senior Manager checking things out and getting feedback. Good for him! I suggested to him that after what I’d seen in Germany an especially at Nottingham’s twin city of Karlruhe, that the city is crying out for tram-trains. His demeanour had Watch This Space written all over it! So do I think that we’ll see tram-trains in Nottingham? Wikipedia says this in the section on further routes for the system. A document raised the possibility of tram-train lines from Nottingham to Gedling and/or Bingham, and to Ilkeston. Obviously tram-trains will have to prove their worth in Sheffield first. Gedling, Bingham and Ilkeston, all are on or close to railway lines radiating from Nottingham, although Bingham on the line to Grantham, is the only one with a station. A couple of points about tram-trains and Nottingham. If tram-trains had been proven and certified for the UK, when the NET was designed and the Robin Hood Line was reopened in 1998, they would have could been used to create a continuous tram-train route between Nottingham to Worksop. Tram-trains release platform space at central stations, as they go straight through the station and on to the destinations where people really want to go. Nottingham station is very crowded with split platforms and other techniques being used to get the number of trains through the station. Look at this Google Map of Central Nottingham. 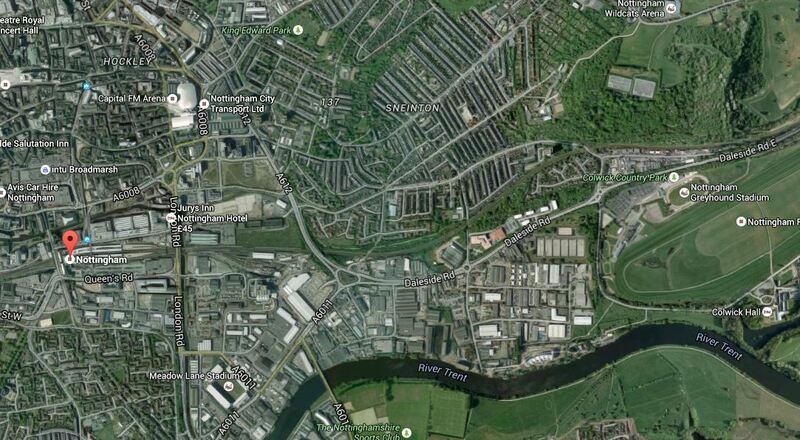 The main station is indicated by the red arrow and note how the railway lines to the East pass to the North of the racecourse in a green corridor from the city centre. To the edge of this map, the lines split into two with the northernmost one going to Carlton station in the Borough of Gedling and then on the Nottingham to Lincoln Line to Newark and Lincoln, whilst the southernmost one goes to Bingham station on the Nottingham to Grantham Line to Grantham. Both lines have a generally hourly service, which given the population density is probably not enough, especially in the more densely populated areas closer to Nottingham. So running tram-trains from Nottingham to a convenient intermediate station would be a means of upping the frequency closer to Nottingham, if you could find a way of getting the tram-trains onto the tram network to finish their journeys. Ilkeston is to the west and a new Ilkeston station is being built at the town. It will be the first station out of Nottingham on a line that goes through the western suburbs of the city, which also passes through some sizeable communities. I said earlier that if tram-trains had been certified for the UK, when the NET was designed and the Robin Hood Line was reopened in 1998, that tram-trains would have most likely been used between Nottingham and Mansfield and Worksop. Nottinghamshire County Council is looking to extend the Robin Hood Line to Shirebrook, Warsop and Edwinstowe on an old freight route. If this extension is done properly, I can’t see tram-trains not being involved. Especially, as an extension like this, would probably be cheaper to build if it was built to tram standards rather than heavy rail. What difference would it make to passengers from say Mansfield or Worksop, if instead of having a direct train service into Nottingham station, they had a tram-train service going direct to Nottingham city centre and the Nottingham station tram stop. New Class 399 tram-trains would probably be used on the route and these would be faster and offer more capacity than the current trains used. There are numerous stops on the route and electric trains save a minute or so at each stop because of their better acceleration. The current frequency is generally two trains per hour to/from Mansfield and one to/from Worksop. Three or four trains per hour should be possible. Train times from Mansfield to Nottingham station would probably be about the same, even though the tram section from Nottingham station to Bulwell takes twenty four minutes, as opposed to ten. There would be no reason, why trains still couldn’t use the direct route into Nottingham station. A present, many passengers going to Nottingham city centre probably now change at Hucknall or Bulwell onto the tram. With tram-tains, they would do the journey without a change. With perhaps extra steps and escalators between Nottingham station and Nottingham station tram stop, interchange between Robin Hood Line and other services might be easier. Obviously, whether this project goes ahed, would be determined by the traffic patterns and needs of travellers. A subsidiary factor would be the amount of freight on the line. Electric tram-trains would not interfere with freight any more than the current diesel units, but if the line was electrified to main line standards, more efficient electric locomotives could be used. I think connecting tram-trains to the northern branches of the NET might be difficult, but as Nottingham is a station on a spacious site, connection to the lines going south might be easier. But what do I know? I only know Nottingham as a visitor and don’t know the demographics and routes of travellers, but it strikes me that it would be possible to use tram-trains running between the southern branches of the NET and the lines to Newark, Lincoln, Grantham and Ilkeston, creating stops or stations at important centres on the routes. As the rail routes already exist, outside of the Nottingham station area, there would be little disruptive construction needed, other than creating the stations and stops. In designing the connection at Nottingham station, remember that trams and tram-trains running as trams are much more manoeuvrable than trains and can go round very tight corners, so can reach places trains cannot reach. As Nottingham station has been through a big remodelling in recent years, I would suspect that the work was future-proofed for any tram-train connection. As tram-train proposals for Nottingham were talked about in this report on the Nottingham Post website in 2009, one has to assume that the connection is at least on an engineering fag-packet in Network Rail’s bottom drawer. When and if, the Midland Main Line is electrified, will have the biggest effect, as it will bring a number of electrified routes into the city. Some of these may be suitable for tram-train operation alongside main line services. To the east of the city, there is the need to sort out the flat junction at Newark, where the Nottingham to Lincoln Line crosses the East Coast Main Line. It strikes me that if this line was an electric route from Nottingham to the East Coast Main Line, this might open up other possibilities. Travel to some stations in the UK, that are also served by trams or light rail and transferring to the local transport is often an obstacle race or a long walk. This is a summary. Manchester Victoria is now a flat transfer, but at Piccadilly you dive into a less-than-obvious subway. In Birmingham, the tram doesn’t yet serve New Street and no plans exist for a proper interchange at Moor Street. In Blackpool it’s a long walk, although there are plans in the pipeline. Sometime! Edinburgh is a trek upstairs and a walk. Sheffield is not too bad, as it’s just a walk up from the bridge over the station. London isn’t good as how many main terminals have easy access to the Docklans Light Railway? Nottingham used to be a difficult one, but now they’ve opened a new tram stop on top of the main station at right angles to the train lines. These pictures show the new stop. Access at present is by climbing up steps from either the station lobby or the main line station platforms. But in the next few weeks it appears there will be an escalator from the main station. To compliment the new tram stop, Nottingham station has also had a makeover. It is certainly, a new interchange, built to the standards that a city like Nottingham deserves. A few months ago, I saw a similar right-angles arrangement, at the main station in Krakow, except that te Poles used a tunnel. From the experience of one day in Nottingham, the interchange appeared to be working well. And it was the first day.